One of the surprises of this year’s Premier League season has been the form of Liverpool. After 4 years of inconsistent displays that have left the Reds languishing outside the top 5, this season they have been far more consistent and find themselves in second place, ahead of the pre-season favourites, Manchester City and Chelsea, and only 5 points behind leaders Arsenal. The next 4 weeks, however, will prove to be crucial to their hopes of making the Champions League for the first time in 3 years with the news that their influential captain, Steven Gerrard, is out injured with a hamstring injury. We decided to look at the various statistics at our disposal from the first 14 games played by Liverpool in the Premier League, where Gerrard played the entire time barring 30 minutes against Fulham. 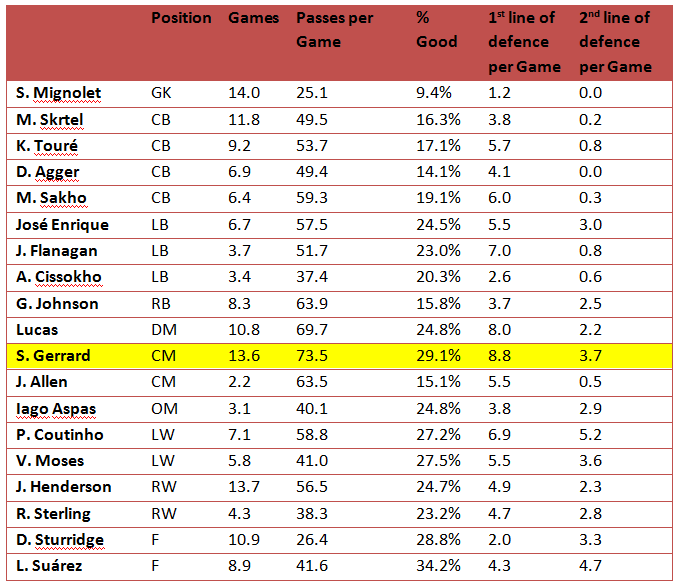 Unsurprisingly, Gerrard is the top passer in the Liverpool team with him averaging 73.5 passes per game. Of course, it is not enough to just pass the ball but those passes need to be of a high quality and need to improve the situation of the team. Of his 73.5 passes per game, 29.1% of them of a high quality. This means that following the pass, the team found itself in an improved position than prior to the pass be it further up the field or under less pressure from the opposition players. The only other Liverpool player to have a higher percentage of high quality passes was Luis Suárez, who has a percentage of 34.2% of good passes. The difference is, though, that Gerrard passes the ball almost double the amount of time than that of Suárez. 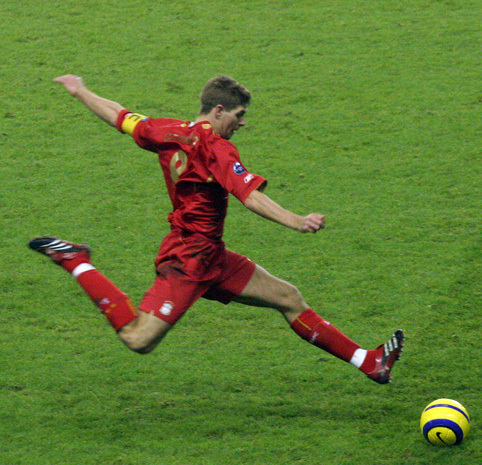 The graph on the left shows the top three players that Gerrard passes to during the course of the game*. The graph on the right shows which players passed to Suárez, the Liverpool player who received more passes than any other*. It goes without saying that the ultimate goal of any action on the field is to get the ball up the field into a position whereby the team stands a chance of scoring a goal. Gerrard is Liverpool’s top player when it comes to passes that break the first defensive line of the opposition. On 8.8 occasions per game, his passes break the first line of defense. Only Lucas comes close to Gerrard’s total. When it comes to breaking the second line of defense, Gerrard actually finds himself in third place behind both Suárez, who breaks the second line of defence on 4.7 occasions per game and Phillippe Coutinho, who has a success rate of 5.2 per game. This being said, Gerrard does pass the ball much more than either of these players and has a greater overall success rate. Clearly, as expected, Gerrard is the heart of the Liverpool team and it is his passing this season that has helped push them up the table. This being said, Liverpool do have the players to cope with his absence. Lucas has already shown this season that he possesses the ability to break the second defensive line and the number of his passes that break the first line of defence is second only to Gerrard. Should he increase the number of passes that he does per game and improve the quality of those passes, ever so slightly, Liverpool may not even miss Gerrard and with him nearing the end of his career, they may have a readymade replacement in Lucas. Undoubtedly, this is Lucas’s time to shine and it will be interesting to see if he takes this opportunity with both hands. I always knew he was one of the best passers in the Premier league!